Designed by mountain bikers, for mountain bikers Northwest Tech custom bike jerseys feature moisture wicking, 4-way stretch fabric that gives riders ultimate comfort year-around. Whether its downhill race laps, enduro stages, or trail rides with the crew, our custom mtn. bike jerseys wick away moisture while also keeping you cool and comfortable along the way. Whether it's blazing hot or chilly cold, Northwest Tech custom bike jersey's were designed for all year round riding comfort for both men and woman alike. We're mountain bikers too, so we give you the option to select from short, 3/4, or long sleeve sleeve length options when designing your custom men's or women's mountain bike jersey. Each custom mountain bike jersey features a longer, drop tail rear design. In simple terms, each bike jersey is longer in the back and shorter in the front. This allows for added jersey length while riding in the saddle as well as added protection from rain, mud etc. This feature also works great for both men and women riders alike. Store your snacks, car keys, phone or safety materials – we give you the option to add a stash pocket to your custom bike jersey. Located on the rear, lower portion on each bike jersey each stash pocket features a waterproof sealed zipper and is easy to access. 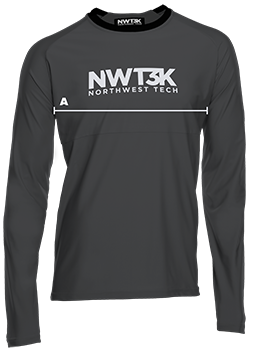 Northwest Tech mountain biking jerseys feature a tried and true race inspired, enduro style fit – not too baggy, yet not too fitted. Jerseys feature both a men's & women's unisex fit. Even better - choose from optional sleeve lengths short, ¾ or long sleeve. Available in 7 sizes (XS-XXXL). Our custom bike jerseys feature a race inspired, relaxed fit, and are built with 4-way stretch fabric. This relaxed fit provides a little extra room all around, but is not baggy. Jerseys are not intended to be super slim fitting.